Yu-Gi-Oh! 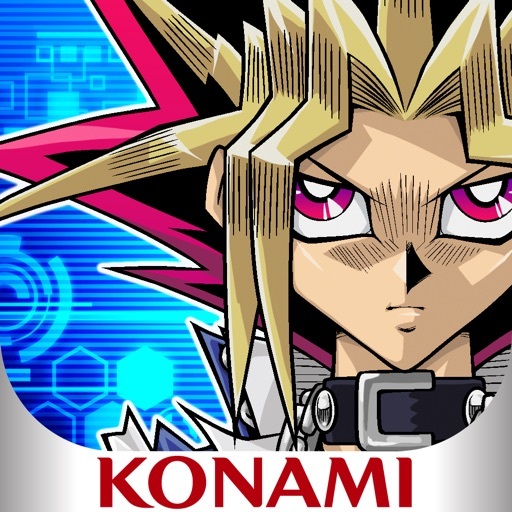 Duel Links (Free) by KONAMI is the latest Yu-Gi-Oh! game for the mobile platform and it is based more on the anime series than the real-life trading card game. 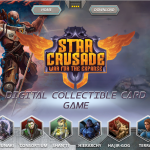 If you enjoy digital versions of trading card games like Hearthstone or grew up with the Yu-Gi-Oh! series and cards like I did, then you will like what Duel Links brings to the platform. When I was in middle school going into high school, one of the things that I became obsessed with at the time, aside from Pokémon, was the Yu-Gi-Oh! anime series and card game. In fact, the card game is pretty much how I got started with my first two relationships, so it’s been a rather big part of my life growing up. I participated in Yu-Gi-Oh! events as a teenager and participated in several tournaments and even high school clubs, usually ranking at least in the top three. I believe I even picked up one or two of the video game versions of Yu-Gi-Oh! when I had the money to, but I always preferred the physical card games due to my collective personality. Needless to say, Yu-Gi-Oh! 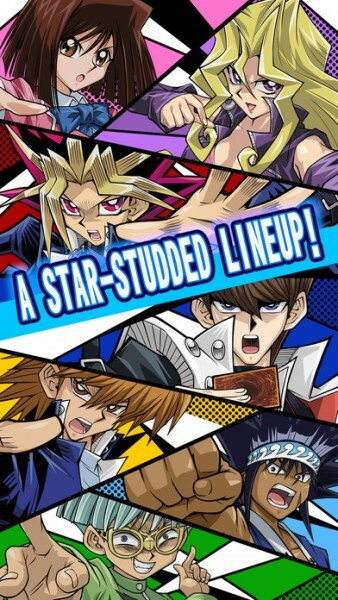 was one of my favorite things as a teenager, and while the obsession has waned a bit as I got into my twenties, I was still excited when I saw Duel Links hit the App Store. Now I get to relive my high school years that were filled with the Yu-Gi-Oh! anime in all of it’s cheesy, corny glory. 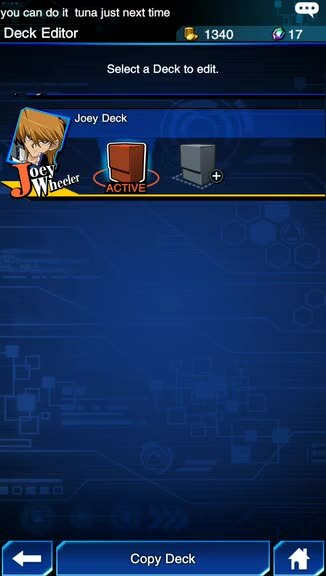 If you’ve ever watched the anime, then you’ll feel right at home in Duel Links. The game features shiny and vibrant anime artwork that seem like they’ve been pulled directly from the show. On top of that, the characters have rather expressive faces that change with their dialogue and taunts, and the cards themselves include original artwork from the real trading card game, even though this is based on the anime. Just like the anime, there are plenty of flashy visuals and graphics, and the dialogue from the characters are hilarious, complete with original voice acting. Animations are smooth and fluid so I had no issues with lag on my iPhone 7, and the background tunes just add another layer of excitement and nostalgia to the game. 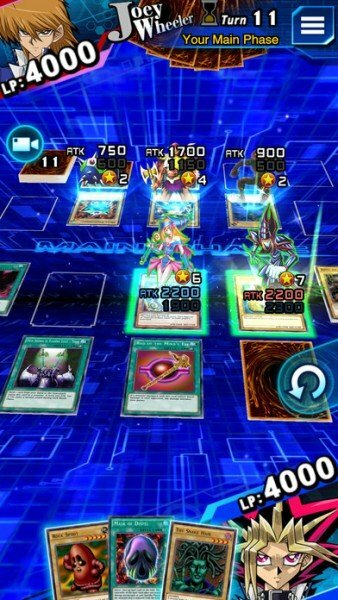 If you were a fan of the show, then you’ll love how Duel Links looks and feels. When you start the game, you’ll be asked to pick one of two characters: Yugi Moto or Seto Kaiba. 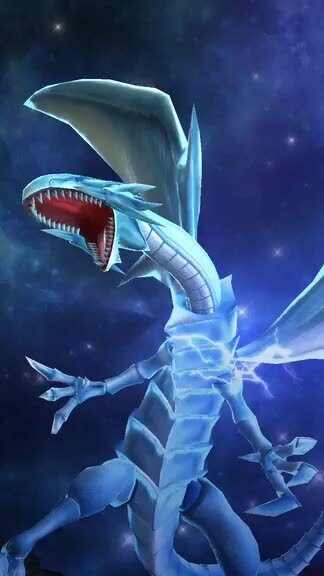 Choosing your character grants you access to their starting deck, which includes their signature cards, the Dark Magician or the Blue-Eyes White Dragon, respectively. Don’t worry about commitment though — you’ll eventually unlock the other character you missed out on later in the game. As you make your way through Duel World, you’ll encounter other familiar duelists from the anime, which you can also unlock as playable characters once you defeat them. Once you unlock other characters, you’ll also get their signature cards in their deck, such as Red-Eyes Black Dragon for Joey Wheeler or Harpy Lady Sisters for Mai Valentine. Even if you’ve never played Yu-Gi-Oh! before, the game is pretty easy to understand how to play since each phase is clearly introduced before you enter it, and you’ll have to manually enter or exit a phase before you end your turn. The basic phases are as follows: Draw, Standby, Main, Battle, Main 2 (optional), and End phase. Each game starts off with a coin toss to determine who goes first, and the one who does go first does not get to draw a card in the first turn. When you do draw, you just tap or swipe on the deck to get a card, and you can tap on any card in your hand to view their effect. 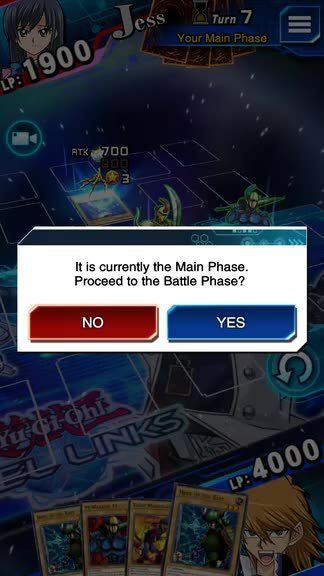 To use a card, just drag it on the field and you’ll get options for normal or special summons for monsters, setting it face-down in defense position, activating or setting magic and trap cards. If you can activate a trap card during the opponent’s turn, the game prompts you so you don’t forget about it. When tribute summoning a level five or higher monster, the game makes it easy to select the monsters you want to sacrifice to bring out the bigger and badder monster out. To attack in the Battle Phase, just drag your finger from your monster card to the opponent’s creature that you want to attack, or directly attack them if they have no defenses. You can tap on a card on the field at any time to view the effect as well, in case you aren’t sure what something does. 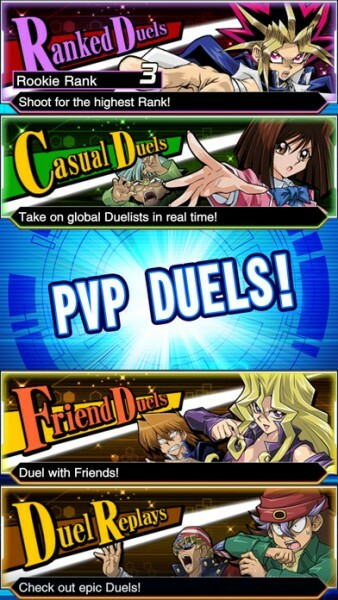 The structure behind Duel Links is pretty simple: you’ll navigate through Duel World and battle other duelists that are hanging around. There are also missions that you’ll want to complete for rewards, such as more gems or more gate keys, which you need for accessing some Legendary Duelists from the television show. Eventually you will also unlock PVP mode where you can duel with random players or your friends once you’ve added them, but don’t expect to be paired up with equally matched people all of the time, as some balancing needs to be worked on in future updates. As I stated before, Duel Links is based more on the anime than the traditional card game. This means that instead of each player having 8000 life points, you only have 4000, and rather than five spaces for monster and magic/trap cards, there are only three. Your deck must also contain between 20 to 30 cards, versus the normal 40 to 60. It’s a watered down version of the anime series, but it works surprisingly well for mobile. Like other card games, the real fun behind Duel Links is your ability to collect cards and customize each deck that you acquire. At the moment, Duel Links includes cards from three sets that are based on the real card game, and you can purchase booster packs with gems. 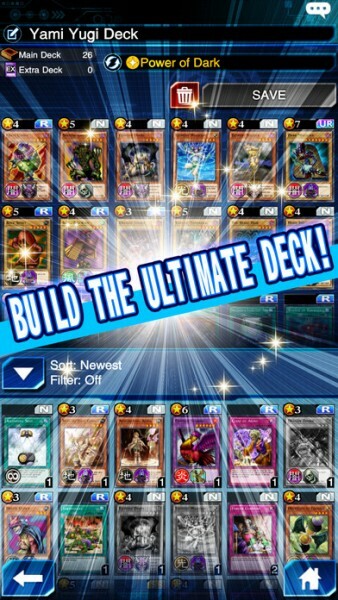 As you just start the game, KONAMI has decided to give players a hefty amount of free gems to start with, so you can acquire a slew of new cards right from the get-go. And even after you spend the initial amount of gems, it’s pretty easy to acquire more as you play the game constantly and level up your characters and collect daily login bonuses. If you are out of gems and really need more cards, you can always purchase more gems or boosters through in-app purchases. When you acquire more cards from booster packs and rewards, you’ll want to customize your deck for better synergy and strategy. You can access the deck editor from the game menu, and there are a few ways to go about editing your deck. You can do it manually by going through your deck and card collection and adding or removing whatever you want, or you can go the lazy way and have the game auto-generate a deck for you with some of your best cards, but don’t expect the best synergy from this method. While this is not a full TCG experience, there’s still a good amount of depth and strategy involved for veteran Yu-Gi-Oh! players. I’ve been playing Duel Links over the past few days and have been enjoying it greatly. It’s a nice nostalgic throwback for me personally, and the visuals look great and the music is fun. The dialogue has been giving me a ton of laughs because of how corny it can be, and the controls are great for touch screen devices. Even though it’s a free game, I feel like it’s pretty generous with the gems and you can get a ton of cards for your decks right from the start, so that’s nice to see. I will definitely be spending time with Duel Links for a while, though I wish that the difficulty in the beginning duels was a bit more challenging. I recommend checking out Yu-Gi-Oh! 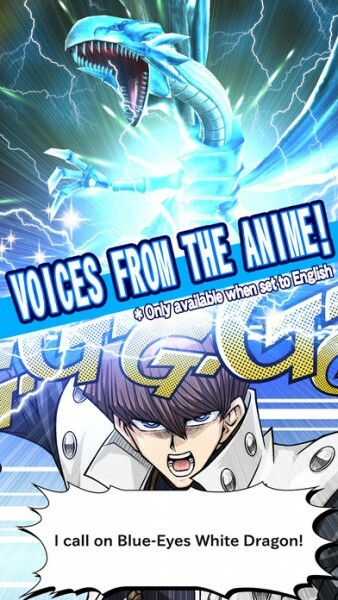 Duel Links if you’re a fan of cheesy anime dialogue, Yu-Gi-Oh!, or card games in general. You can find Yu-Gi-Oh! Duel Links on the App Store as a universal download for your iPhone and iPad for free with in-app purchases. 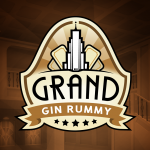 The game is also available on Google Play for your Android friends.